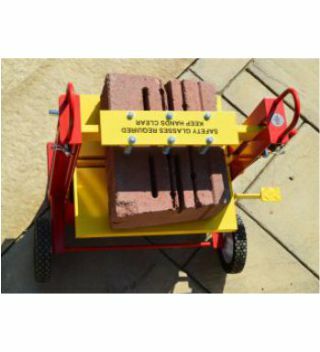 The Kracker Wall Splitter is designed to work smarter not harder on Hardscape Jobsites. The Kracker works with a easily pumped hydraulic foot action pedal; no more long lever poles that send shock waves up and down your back like other splitters on the market. The Kracker Wall Splitter blades are made of hardened steel, so there is no need for expensive replacement blades. The Kracker provides a very wide wheel base for easy splitting on rough jobsite terrain and is moved into a skid bucket or tranports onto a trailer without toppling over. No more shimming wall block to make a clean split. Cutting and Dressing block? 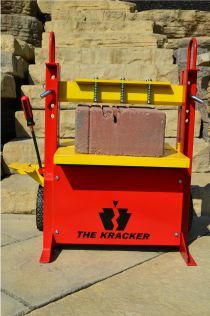 Use the Kracker Wall Splitter: dust-free, quiet operation, saves labor and expensive diamond blades. Made in the USA.